Researchers discover previously uncharted part of the eye. The retina is a layer of tissue in the back of the eye that converts light into nerve impulses. The retina contains small, specialized neurons called bipolar cells that transmit information from light-sensitive photoreceptor cells to ganglion neurons, which send information to the brain for interpretation as images. Now, researchers from Yale University School of Medicine and the National Heart Lung and Blood Institute say they have discovered a thick band of microtubules in certain neurons in the retina that they believe acts as a transport road for mitochondria that help provide energy required for visual processing. The study is published in The Journal of General Physiology. Previous studies show that the specialized neurons of the retina known as Bipolar cells, are continuously active, a characteristic few other neurons share. They require a constant supply of energy to mediate the sustained release of the contents of an enormous number of synaptic vesicles, which store the transmitters that convey information between neurons. An intriguing new study of their subcellular structure could help explain how bipolar synaptic terminals meet such excessive energy demands. The current study used cutting-edge 3D microscopy to examine the subcellular architecture of presynaptic terminals in retinal bipolar cells of live goldfish. The team explain that goldfish retinal bipolar cells have giant presynaptic terminals that make them especially amenable for investigation. Unexpectedly, the team discovered a thick band of microtubules, a component of the cell’s cytoskeleton, that extended from the axon of the neuron into the synaptic terminal and then looped around the interior periphery of the terminal. The researchers state that the microtubule band appeared to associate with mitochondria, organelles known for providing energy to cells, in the synaptic terminal. When drugs were administered to inhibit the movement of certain motor proteins that transport mitochondria and other cargo within the cell by traveling along microtubules, the mitochondria accumulated in the axon of the neuron and never made it to the synaptic terminal. The findings suggest that these previously unknown microtubule structures provide a ‘roadway’ for the transport of mitochondria crucial to maintain energy supplies into the synaptic terminals of these highly active neurons associated with vision. 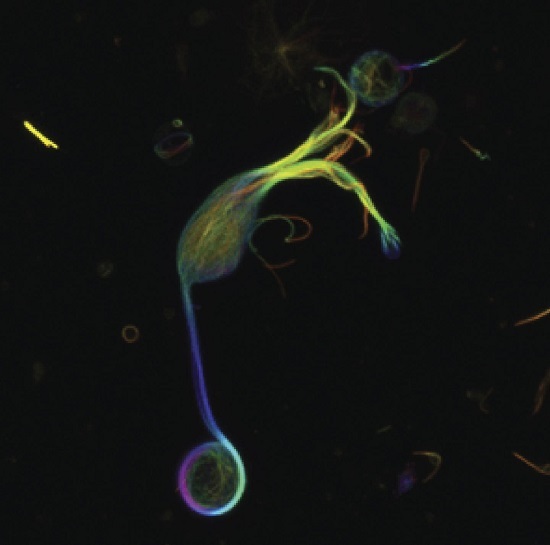 Fluorescently labeled microtubules extend from the tips of the dendrites (top) into the axon and down into the giant synaptic terminal (bottom) of a single isolated goldfish retinal bipolar cell. A loop of microtubules encircles the inner plasma membrane of the terminal and anchors mitochondria. Credit: Graffe et al., 2015.